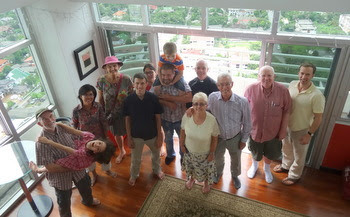 We had a great service last week with 20 people in attendance – our largest congregation so far – including my parents, who it was great to welcome to Chiang Mai again. This was followed by a great brunch at Marc’s 26th floor apartment in the tallest building in the city! Thanks Marc, for a great time together! This Sunday our readings are taken from Genesis 32:22-31, Romans 9:1-5, and Matthew 14:13-21, and we will be singing the hymns All People that on Earth do Dwell, Called as Partners in Christ’s Service, Break Thou the Bread of Life, and Beauty for Brokeness. You can find the readings via this link. Our new building ready for Worship! 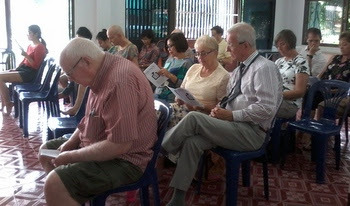 We had a great first service this week at Kaeo Nawarat Road, Soi 2/2 – our new church home! There was a great turn-out as we worshiped together and celebrated the love God has for all people! The text was from Romans 8 – There is no Condemnation! The service was followed by a delicious pot-luck meal. This Sunday Elena will be preaching, and our readings are Genesis 28:10-19, Romans 8:12-25, and Matthew 13:24-43, and we will be singing the hymns All Creature of our God and King, There’s a Spirit in the Air, Let us Break Bread Together, and All are Welcome. You can find the readings via this link. What a wonderful weekend we just had! On Saturday we gathered at our new building to paint, clean and make ready for worship, and then on Sunday we had our last service at 18 Pa Tan Road, including Noom’s baptism in the River Ping. Fifteen of us spent about six hours on Saturday, cleaning, organising and painting. 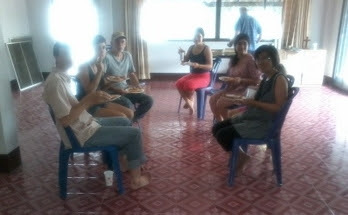 It was a great time of fellowship as we worked together as well as a necessary preparation for our new worship centre. Despite many having valid excuses not to turn-up, people came. And the turn-out was 150% of our average Sunday congregation! We stopped at about 1pm to share pizza for lunch! Even the kids enjoyed painting! Those who have not yet had enough, can join us again at 10 a.m. on Saturday to finish the painting and get everything ready for next Sunday. 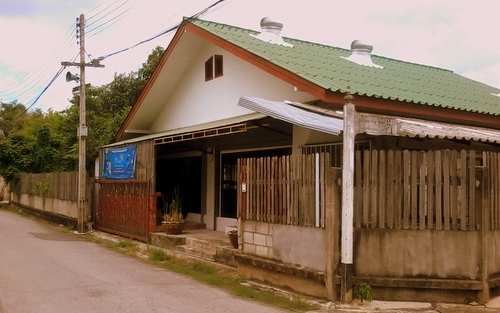 Last Sunday we gathered at 18 Pa Tan Road for the last time. It was sad to say goodbye to our beautiful outdoor worship by the river, and we remembered many friends who had worshipped with us during the year, including the Chase family and Darryl and Lindy. However, it was also a time of new beginning,as we had our very first baptism, as Noom was baptised in the very muddy River Ping! Video of the baptism can be viewed here. So now God leads us onwards! This week we will have our first service in our new building at Kaeo Nawarat Road, Soi 2/2. This will be a service of thanksgiving and dedication as we rejoice in all that God has done for us, and, of course, we will share the Eucharist together. The service will be followed by a pot-luck. This Sunday our readings are taken from Genesis 25:19-34, Romans 8:1-11, and Matthew 13:1-9,18-23, and we will be singing the hymns Guide Me, O Thou Great Jehovah, Let Us Build a House, I am the Bread of Life, and For All the Saints! You can find the readings via this link. Ecclesia a nobis – We have a church! Of course, the church is the people, but it’s great that we now have our own building. Yesterday, Elena and I went down to the new church building to get the keys. We now have our building. She was greatly impressed by the space. I have a list of paint, brushes, rollers, and cloths to buy, ready for our fixing-up day on Saturday. We will meet there at 10 am. Bring old clothes and a happy smile! Lunch will be provided. We already have tables, chairs and drawers there, purchased at a very good price. Thanks to William and Tarntip for transport to the place selling them, and Matt and Noon for assisting in carrying them back to the church! This Sunday is our last service at 18 Pa Tan Road. After almost one year of worship on the terrace we are moving on. It has been a great place to praise God in the midst of nature. We may even get to use the river this week! Our first service in the new building will be the following week on Sunday 13th July. The service will also be followed by a potluck. Directions to the new place are on the website! This Sunday our readings are taken from Genesis 24, Song of Solomon 2:8-13, and Matthew 11:16-19, 25-30, and we will be singing the hymns Holy, Holy, Holy, Lord God Almighty, Alleluia Alleluia Give Thanks, Come Down O Love Divine, and Love Divine all Loves Excelling. You can find the readings via this link. Video and audio of our major services can be found on the Audio-Visual page of the All Saints website and as always, directions can be found on the Where and When page.